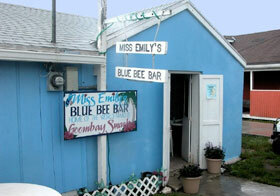 The Legandary Miss Emily's Blue Bee. The Green Turtle Ferry will pick you up here. 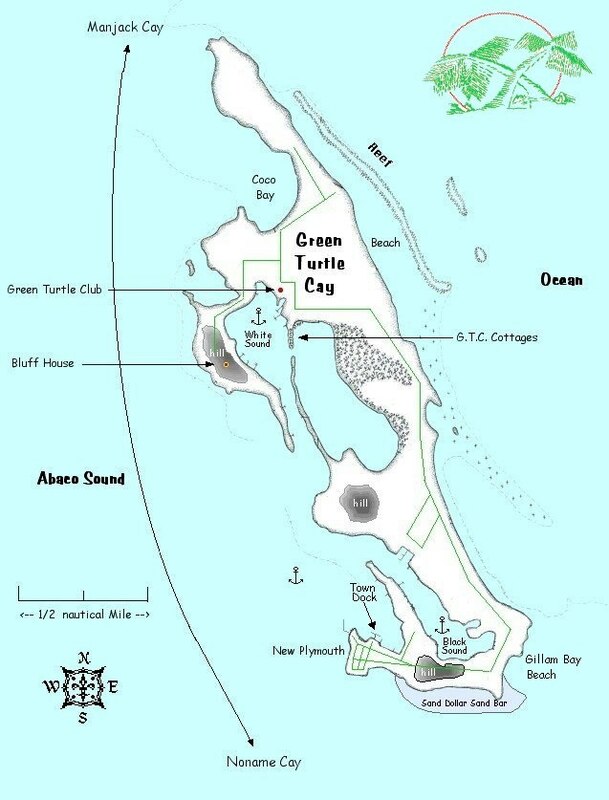 Green Turtle Cay (Map) is the most northern cay in the Abacos with any populace. For vacationers, it has plenty to do and explore and especially suited for families. It's where it all started for this writer when it was still British, back in '73. It is where we spent our early days almost exclusively. 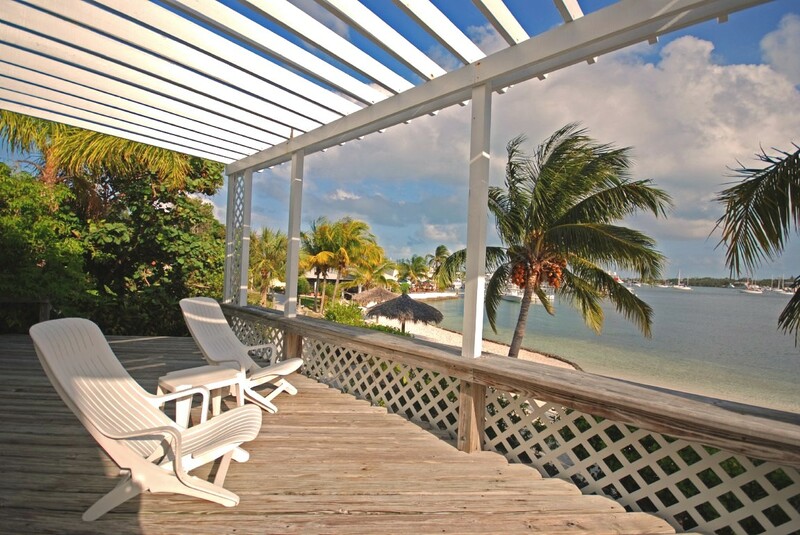 The Cay is idyllic for romantic getaways, and a great place for family vacations. 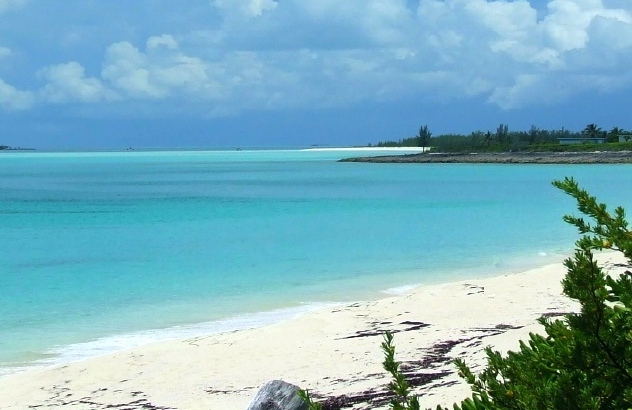 Green turtle Cay is one of Abaco's two popular destination wedding venues and kicks off both the fishing tournament season and "Regatta time in the Abacos". Green Turtle also inspired Jerry Eickhoff who fell in love with this Island as so many do. He wrote the song about the Cay attached to our popular slide show. The Village of New Plymouth (Map) was originally settled by the loyalists in the 1770's. 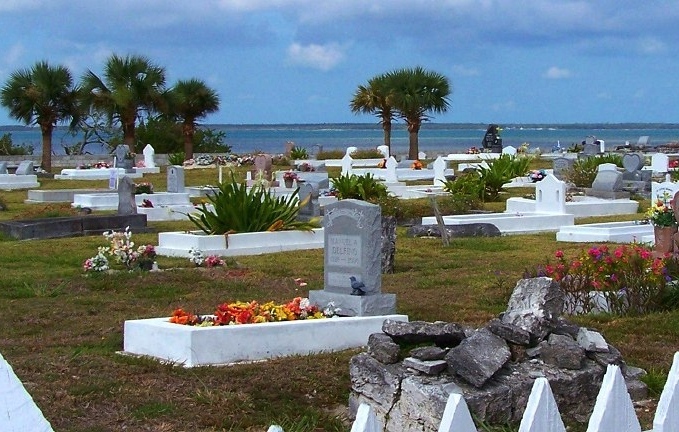 Today the family names of those original settlers still predominate the Abacos. Some more so on some cays than the others. The names you will here are Bethel, Sawyer, Lowe, Albury, Malone, Sands, Thompson, Roberts, Pinder and Macintosh. 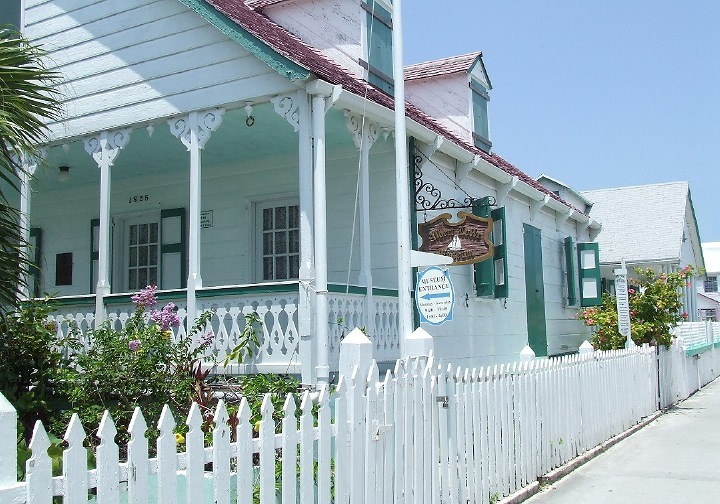 The quaint brightly colored picturesque village can be walked in less than 15 minutes end to end or about two hours covering all the side streets and stopping in every store including having a Goombay Smash at Miss Emily's. Oh, the Goombay Smash is the national drink. More later. Finding any of the named places in this guide is as easy as asking somebody on the street and then it wont be more than 5 minutes from where you're standing. 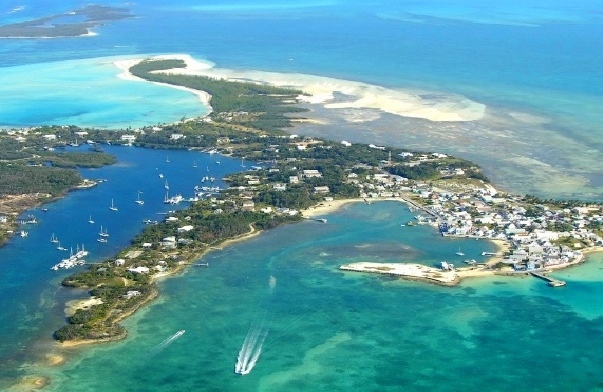 Access to New Plymouth and Green Turtle Cay is of course only by Ferry - the "BOLO". Nigel, Larry or Curtis will probably be your captain. The BOLO runs from anywhere on the island to a dock on the mainland (Video) serving the airport (by land Taxi) at Treasure Cay. Connecting commuter flights here are to Miami, West Palm Beach, Ft. Lauderdale. and Nassau (See Air Carriers). Lobstering and tourism are the main industries of the island today. 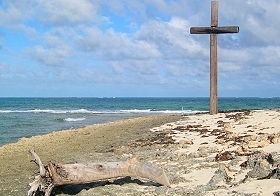 The village of four churches, the most of any cay, serves the islanders spiritial needs. There are hardware stores, gift shops and food markets in New Plymouth. Merchandise arrives regularly from Marsh Harbour or directly from the states. You will often see the freight boat unloading at the tip of the settlement. Added to shipping, the Bahamian Government places a hefty duty on many items which makes some items a bit costly. Occasionally a doctor sets up practice only later to leave as there was just not enough "business" to keep him or her there. Today you will find a clinic with a nurse. For anything more serious you'll have to go to Marsh Harbour, Nassau or preferably Florida. Be sure to stop by for a visit at the Albert Lowe Museum for a peak at the settlement's earlier times. You'll also find here beautifully crafted model ships built by the late Mr. Lowe and art works by his renowned son Alton. Alton has a gallery in his lovely home. It's a 15 minute walk on the other side of settlement hill. 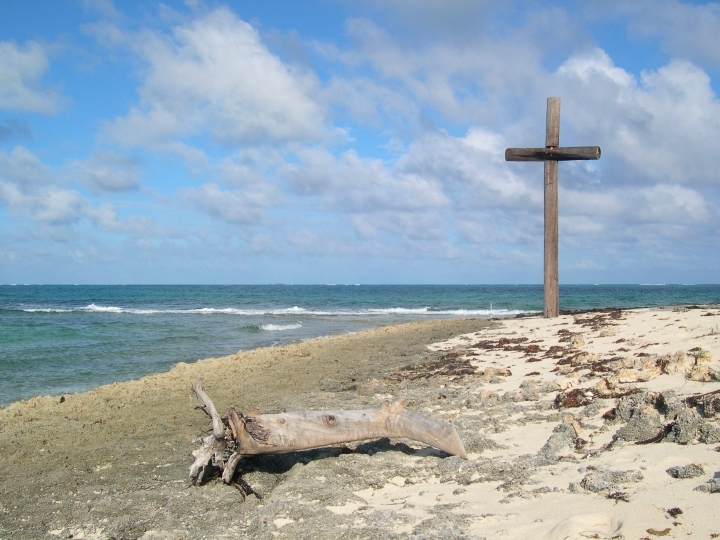 See our page on Abaco Art. The model ship building continues by still another son, Vertrum, whose work can be found along with other local artists at Vert's Model Ships. Other points of interest is the Loyalist Memorial Sculpture Garden featuring Bronze busts of many of the influential folks of days gone bye. It's in the middle of town, you cant miss it. 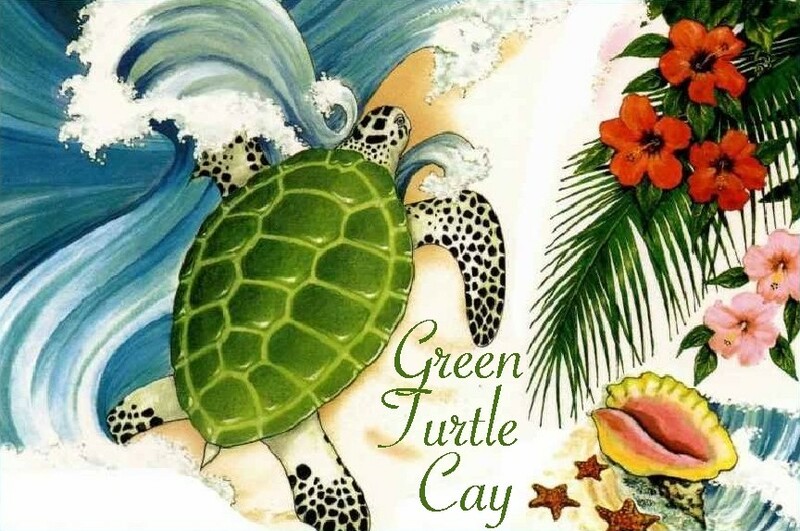 May is the Annual Green Turtle Heritage Festival. 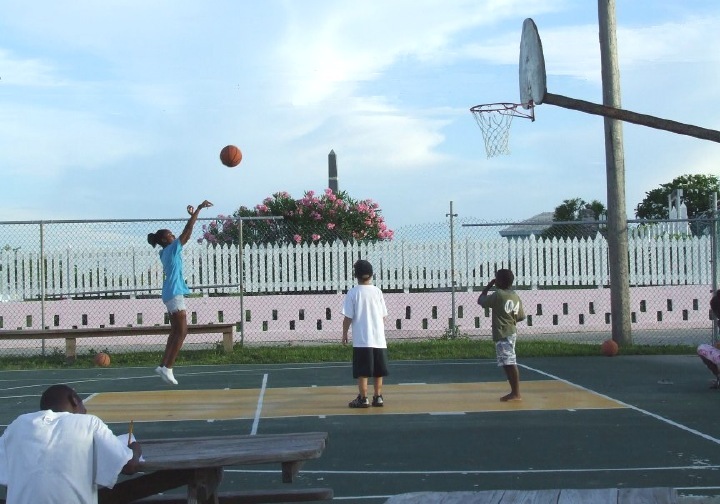 The well received event established a "Sister City" connection between historic Green Turtle Cay (New Plymouth) where the Loyalist first settled in 1784 and Key West, Florida, where many Green Turtle Cay residents relocated in the ensuing 150 years. When planning a trip to Green Turtle, you might want to consider this event. But book early. In recent times, other Cays have begun similar heritage celebrations too, albeit smaller versions. (See Flotsam & Jetsam). New Plymouth lies on the western side of settlement harbour, where resides the once lovely and quaint turn of the century New Plymouth Inn, reminiscent of Bogey and Bacall. It opens and closes at the whim of it's proprietor. Still it had one of the most romantic restaurants in all the islands. Whether it will be open, is all up to Wally, its a-tad-eccentric, long time owner. It's location in the middle of the village, away from beaches and marinas, probably has something to do with past difficulties. New Plymouth eateries abound: at last count (2019) there are nine! In no particular order there is the "Wrecking Tree" one of the few places that will make conch salad to order, and the popular "McIntosh's Bakery & Restaurant". It's on the street going up the hill facing the cemetery. Then there is everybody's long time favorite "Laura's Kitchen". You'll find it just up the street from the town dock. Here you will get your plate piled high with food reminiscent of an Amish restaurant and all for a reasonable price (no alcohol here). A long time fixture has been Mikes Bar & Restaurant, now called Mikes Sundowner. Mike's is another on again, off again place but recently caught on again. 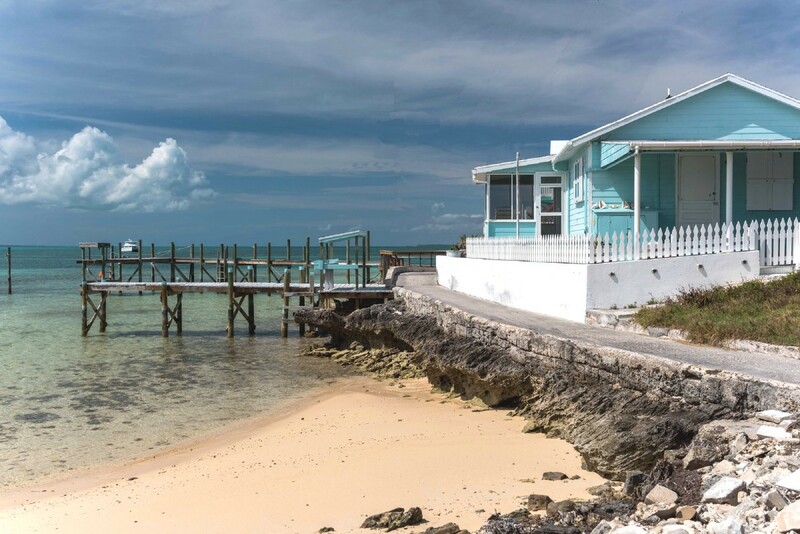 It's right on the water facing the Sea of Abaco. Like so many others their schedule is sporadic. Hail them first. On the "bottom" of the main street next to the freight dock is "Plymouth Rock Bar",- restaurant, liquor and cigar store. It provides counter seating only and for about eight. Pineapples Bar & Grill on the other - eastern side of settlement harbour is actually on Black Sound has a great pool for luncheon and dinner guests and on occasion has live music in the evening. 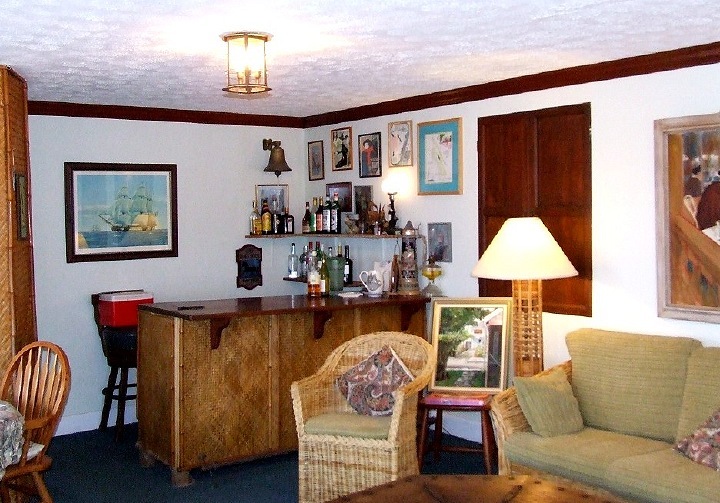 It also has cottages for rent and it is accessible by rental boat. For contemporary dining you'll have to try "Harvey's Island Grill". It's on the harbour side of town. No alcohol is served but BYOB is OK. Here the menus consists of not your typical Bahamian fare, but state side favorites such as duck and lamb etc. and all at reasonable prices. And finally the newest, not to be confused with Laura's, is Laures Kitchen serving "Authentic Asian Food". And in this case Asian includes Indian, Thai, Korean, Chinese and Japanese and yes Sushi! Check menu of the day first. It's located on Crowne St. behind GTC's Govt. House. 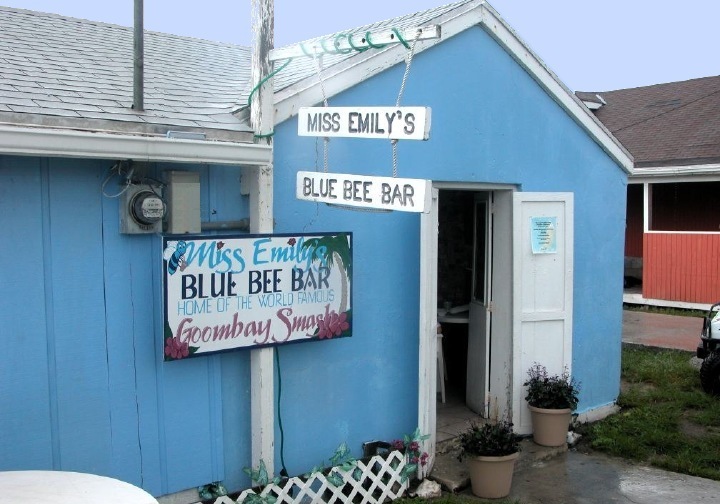 For decades the favorite night (& day) spot for the visiting yachtsman and island hopping pilots alike, has been "Miss Emily's Blue Bee Bar". Miss Emily was the originator of the Bahamian national drink - the Goombay Smash. Miss Emily passed away in 1997 but the traditions of her "establishment" are now being run by her daughter Violet. Recently she has added an attractive dinning room serving lunch and dinner. The house specialties are Goombay Lobster or Blue Bee Special Grouper. Just up the hill from the Blue Bee is the island's hot spot, the "Roosters Rest" home of Kevin and the Gully Roosters playing the Bahamian staple, Rake & Scrape, with some Reggae and Soca (Calypso) added to the mix. They too, I hate to say, open with a west wind, but can be usually found playing at the G.T.Club. every Wednesday. For additional dining, you'll have to head to the north end resorts. Rental homes, villas and cottages are scattered through out the island. 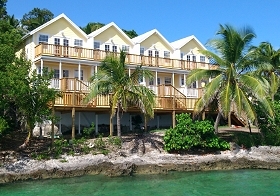 At the pristine north nestled between a lovely ocean beach and Coco Bay are the Cocobay Cottages. (golf cart needed here). Their beach is great for snorkeling and it is not uncommon to see a lobster or two (which may be taken in season only). 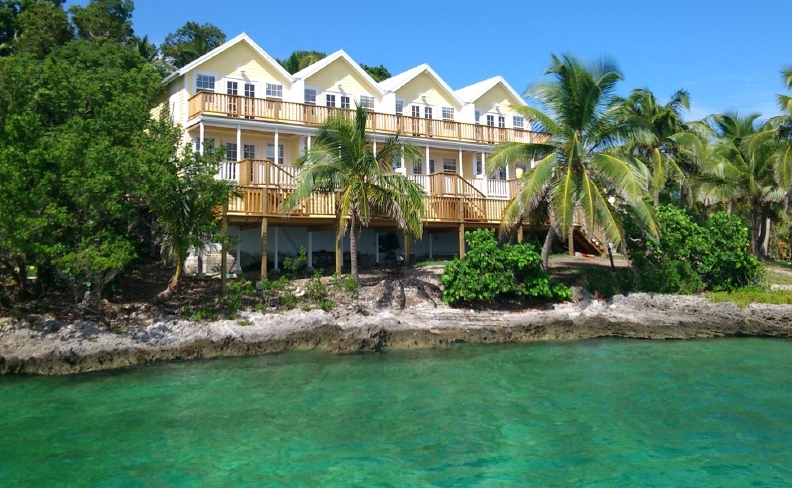 And not far from them on the other side of Coco Bay you will find Turtle Dreams Cottage. Closer to New Plymouth, a few names that come to mind are Linton's Cottages, Long Bay House and Bita Bay House. which are on or near the lovely beaches at Gilliam & Bita Bays. Add to that. it's only a 15 minute walk to town. Also there is Robert's Cottages on Black Sound. A couple rental agencies of rental homes are Green Turtle Rentals, who also rents golf carts, mentioned below. 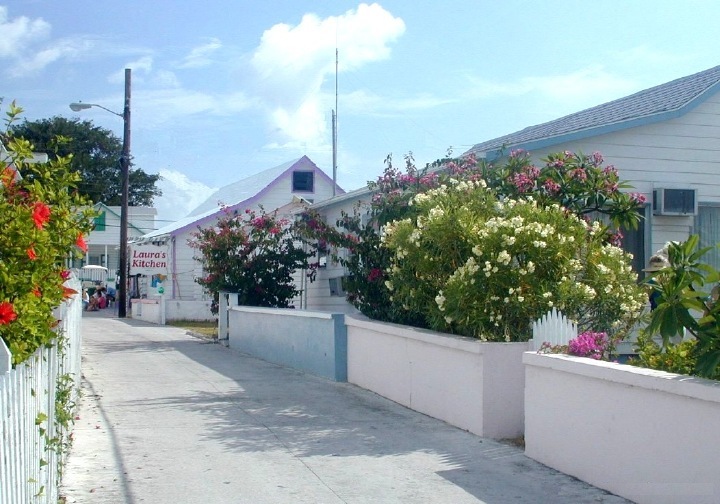 and Abaco Property Management. Still more can be found on our Accommodations and Services page. Leaving the settlement for the north end of the island on its "Queens Highway" you will pass the relatively new Leeward Yacht Club and Marina. It's on the east side of Black Sound and often their condos are for rent. It offers a pool and restaurant. Their Lizard Bar & Grill is often active with folks using their marina and makes for a great pit stop. On the north end of Green Turtle Cay on White Sound, you will find The Green Turtle Club and the Bluff House. Each has a marina, pool and offer rooms and villas for rent. There once had been a long standing rivalry between them as the managing owners of each were sisters. Seems even in paradise there are family feuds. The Green Turtle Club has a first class restaurant, comparable to state side fine dining. It's restaurant is adjacent to their Tipsy Bar and steps from the marina. They offer cottages right on the water where you can tie up your rental boat. That be our choice. Pool side villas are also offered too. The Gully Roosters usually stop by for a gig on Wednesdays playing under the stars on the marina deck. This writer finds the Club a little more upbeat and an easier location to get "to and from", and explore the north end and its beaches. Add to this the fact the paved town road ends at the Club. Still a rental cart or boat is needed. The Club is within a 10 minute walk to a lovely bay beach at Coco Bay and 20 minute walk to a beautiful stretch of ocean beach with all the diving and snorkeling you may want. 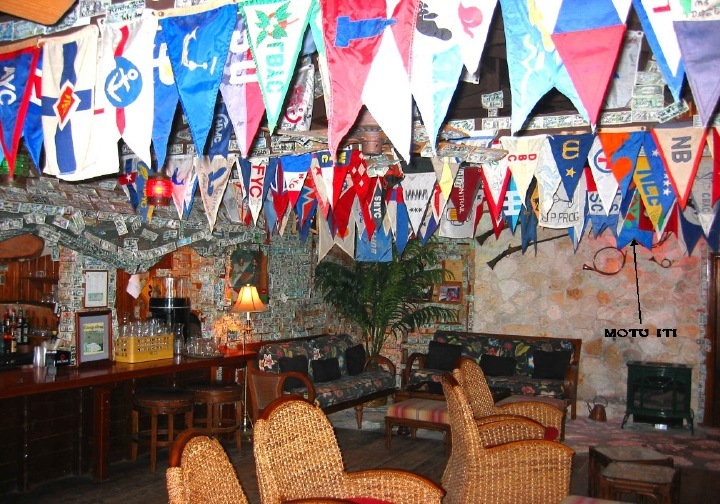 The Club's Tipsy Bar is a typical island haunt with dollar bills and boaters burgess tacked to the ceiling. You can find my "Motu Iti" burgee hanging there. It's a lively spot hosted by the ever smiling Debbie. She has been there close to 35 years and is everybody's best friend. She will gladly provide a "Tipsy Turtle" (which will do the job for which it is intended). As mentioned, Wednesday, the Gully Roosters come over from town (with half the population) to play at the club. At this point we have to mention our friend of close to 40 years, Brendal Stevens. I'd call him the unofficial Ambassador of the Goombay Spirit. He is also the co namer of the Goombay Smash. (Short video). He once entertained at the G.T.Club bar with his one man band and was bartender by day. He'd often be seen playing chess with multiple patrons while performing his chores as mixologist. He later ran the clubs dive shop for many years. Eventually he and his wife Mary, and with her full time assistance, opened Brendals Dive Center adjacent to the Club attracting divers from all over the world. As far as diving goes, Brendal can take you on any type dive you want, however our favorite is the day trip where he will catch your lunch and cook it for you on an uninhabited beach. 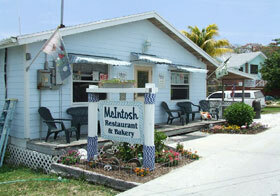 Depending on the season, it will be lobster or grouper, with conch salad and his special punch. You may have seen Brendal featuring this picnic on the cooking channel and his diving adventures on ESPN. If you'd prefer a fishing picnic, some of the fishing guides provide the same thing. Lincoln Jones is no doubt the main man in this regard 365-4223. If sport fishing is your thing, whether it be inshore bonefishing to offshore game or reef fishing contact the Sawyers, a family of fishing guides. Call Ronnie or Rickie at 365-4261. More guides can be found listed on our Services & Accommodations Page. Boat Rentals: There are three boat rental agencies on Green Turtle Cay. The oldest is Donnie Sawyer's whom we've been using since day one. Recent times have seen "newer used boats" as part of his fleet. A 15-17 footer is all you'll need to get to Green Turtle's adjacent cays, assuming typical summer type weather. 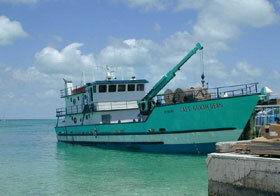 Other rental agencies are Reef Rentals and the newest is Sunset Boat Rentals. The latter offering bait & tackle. Be sure to see our page on Boating. The local car rental is actually a golf cart rental with a couple agencies coming to mind. 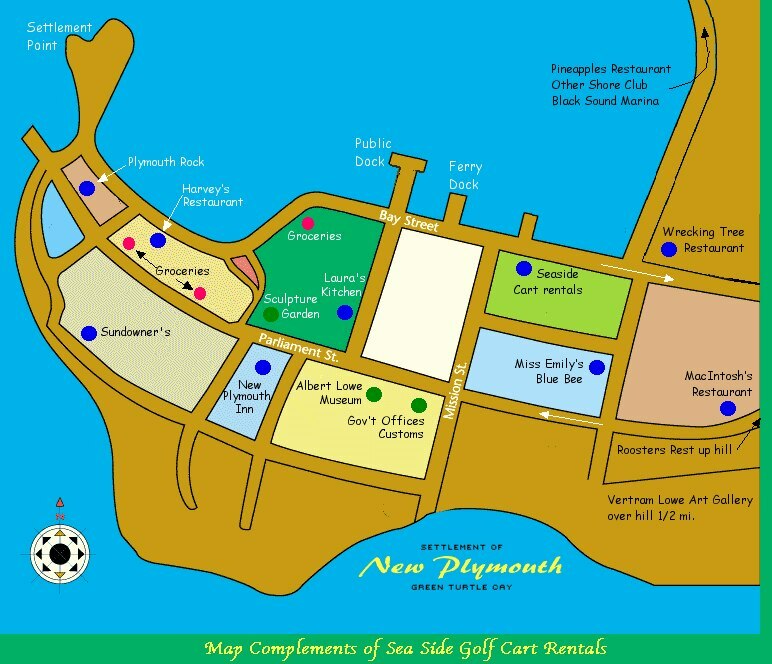 Marilyn Sanders' Sea Side Cart Rentals 365-4147. She is also the proprietor of Green Turtle Property Rentals mentioned above. Her office & dock are located conveniently next to the ferry dock in New Plymouth where you can arrive, pick up your cart and head to your destination. If you are also renting a boat, her customers are free to use her town dock. Donny & Giselle McIntosh's also rent carts and can be found at D&P Cart Rentals 365-4655, located conveniently at the G.T. Club. Another alternative is Omri's on again - off again Taxi. If all else fails just get out to the road and stick your thumb out, the old fashioned way. You needn't fear and its guaranteed to work.